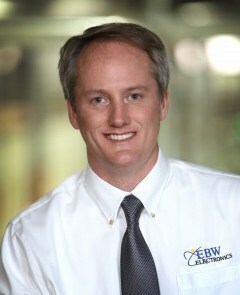 Cory Steeby, the President of EBW Electronics, is an expert in leadership with 20 years of design and application experience. He oversees development of the company’s diversified customer base spanning multiple industries and specializing in the design and manufacturing of printed circuit board assemblies (PCBA). His ability to plan ahead and anticipate future demand for the contract electrical manufacturing services is the foundation for the rapid growth. His experienced electrical engineering and production team takes pride in consistently delivering you quality electrical components and assemblies on time. Steeby holds a BSEE from Calvin College.